Energy flux is the common denominator of all natural and human systems. Literally, energy means the capacity to do work —— to move against a force, to create a rise in temperature, to cause a fl ow of electrons, to facilitate the process of photosynthesis. A living organism can be viewed as a chemical system designed to maintain and replicate itself by utilizing energy generated by the sun. The artful manipulation of energy is essential to the supply of food, to physical comfort and to improving the quality of life beyond rudimentary activities necessary for survival. The concept of energy has a transcendental quality, both in physical and metaphysical terms. It is a reality, with a proven validity and durability. The concept of energy transcends mathematical description or its application in classical Newtonian mechanics as well as its currently accepted roles in the twin intellectual revolutions of Einstein’s special theory of relativity and Planck’s theory of quantum mechanics. The genesis of energy is central to the mystery of our existence as animate beings in an inanimate universe. The most disturbing impression gained from any study of energy phenomena, in both a social and physical sense, is the present and ever growing energy shortage. The original and ultimate source of all energy on earth is the sun. The extensive utilization of solar energy seems the most likely long-range solution to the energy crisis. My early sculptures were directly infl uenced by the concept of this solar energy source, but were representative of the boarder sense of energy as both a physical and metaphysical concept. Among the most novel proposals for effi cient harnessing and utilization of solar energy involves the orbiting satellite power stations. The idea is that solar energy would be converted into high intensity microwave power using either solar cells or helium turbogenerators, beamed at selected receiving stations on the surface of the earth. Each receiving station would consist of a large array of paraboloidal microwave antennas and a power conversion facility. An orbiting power station could overcome much of the inherent ineffi ciency of earth based solar power systems, which is due to the large percentage of incident solar energy radiation absorbed by or refl ected from our atmosphere. If this proposed system becomes a reality a large portion of the countryside will be covered with these parabolic structures. This and other solar energy harnessing systems may cause us to witness a major change in architectural shapes, from the prevailing rectilinear and round forms to parabolic structures. This possibility of transforming large quantities of solar energy into electrical power led me to a lifetime of exploration of the parabola and parabolic shapes their natural forms in nature, their inherent physical and optical properties, and the social implications of these energy trapping structures. The parabolic shape is found to exist in a wide range of natural forms and physical phenomena :e.g, trajectory of projectiles, acoustical and microwave reflectors, parabolic sand dunes created by wind action, as well the parabolic shape of graphical representation of many physical phenomenon in the fi elds of fluid and aerodynamics. What particularly impressed me was the inherent ability to concentrate, in lens and refl ector modes, all forms of electro-magnetic and acoustic energy to a single focal point. Accordingly, I became very involved with creating works of sculpture using parabolic shapes. 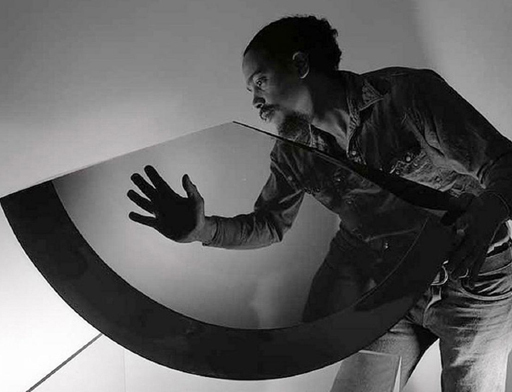 My early sculptures consisted of transparent, multi-color plano-concave cylindrical parabolic lenses. Some of these lenses had a full parabolic surface; others had apertures at the center either large or small. A few of the lens were cut to result in a tapered cross-section in the vertical plane, thinner at the top than at the bottom. The transparent pieces employ the inherent image and energy concentrating properties of the concave parabolic shape which act as giant multi- hued fi sh eye lenses which capture an image within themselves of all of the surroundings. These transparent lenses also concentrate light energy, which is projected onto the environment and the spectator. The visual cognition of this energy concentration causes many to perceive them as iconic or monadicm objects possessing their own internal source of energy. Eventually my sculptures evolved into translucent and opaque plano-concave parabolic discs. They act as front surface parabolic mirrors of refl ectors that capture and focus the frontal light energy onto an imaginary plane or point that appears to be suspended in space between the parabolic surface and the spectator. The physical energy phenomenon, represented optically by the sculptures, represents the entire spectrum of electromagnetic and acoustical energy. If Freud, Reich and the Egyptians are correct about their assumptions regarding physical energy, my sculptures may prove to be valid concentrator of metaphysical energy. it is somewhat ironic that my principle sculptural medium-polyester resin-- is a petrochemical product, the energy source in shortest supply. The original goal of my early pieces of sculpture was to create kinetic art without using kinetic elements such as mechanical movement or artifi cial light changes. In their place I preferred to employ natural changes in light, the environment and the spectator to create the kinetic effects. This emphasis changed in 1977whenI discovered the existence of the Savonius Rotor (Wing-Rotor) windmill. This vertical-axis Windmill is characterized by very simple construction, with only one or two rotating bearings - Omni-directional sensitivity to the wind direction, and little need for a tall mounting tower. I utilized the theory of the Savonius Rotor windmill to design and construct the 12-Meter tall double parabolic sculpture for the entrance of the Dade County (Miami) International Airport. The twin parabolic shapes, which are constructed of mirror polished stainless steel, are mounted onto a circular turntable. An electrical generator is mounted under the turntable and attached to its central axis. When wind strikes the twin parabolic shapes it causes them to rotate around their vertical central axis and thus rotate the generator causing it to generate electricity. The resulting electricity energizes the neon lamps located around the periphery of the twin parabolic shapes. The stronger the prevailing wind, the faster the vertical rotation of the parabolic shapes, and the brighter the neon illumination. The sculpture acts as a kinetic visual anemometer. My inital involvement with the use of wind energy to create physically kinetic sculpture has led to a series air current activated suspended rotating sculptures. These sculptures are spiral airfoils each containing hundreds of internal plastic prisms which refract the sunlight into moving spectra cast upon the environs thus celebrating both solar and wind energy. I have also created a series of transparent fountains, which utilize crystal clear mineral oil (petroleum), as the liquid fl owing medium. The crystal clear oil creates waves as it fl ows over the surface of the sculpture, with each wave acting as a liquid prism refracting the sunlight into moving spectra cast upon the environs. Thus, they are a celebration of solar and fossil energy. Energy has been a source of inspiration and speculation for poets, mystics and philosophers through the ages. inlets of Soul in this age.